by Debra &. 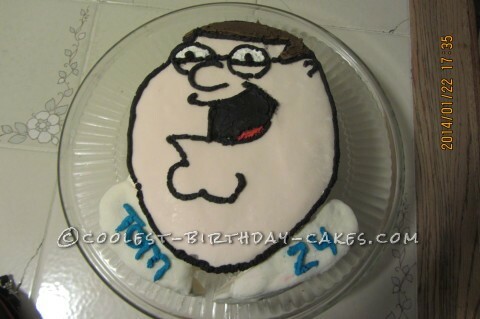 Steph M.
I made this Peter Griffin birthday cake for my son Tom’s birthday, he’s a big fan of Family Guy so I thought I would make this for him. The internet was a huge help, it gave me several different pictures to choose from so after a while of searching for the right one. I chose this one. It’s pretty simple, just baked two-nine inch round cakes, let them cool and gathered all of the supplies that I would need while they were cooling. I put a layer of butter cream icing between the two cakes then put one on top of the other, dirty iced them so they could be covered with the skin toned fondant that I made from marshmallows and tinted with the gels. I rolled it out to the size I wanted then carved his head out of the cooled cakes. I put the rolled fondant on top of the cake, smoothed it out and trimmed off the excess that wasn’t needed. Next I outlined the picture with a sharpie, then with a piece of waxed paper and a skewer I poked holes on the waxed paper to thoroughly outline the picture, then I put the waxed paper over the fondant and centered it on the cake. I then began to outline the picture of Peter poking the skewer through the holes that I previously poked in the waxed paper making sure not to miss any. I then outlined the whole picture with black butter cream icing that I also tinted with the gels. Next I tinted all the remaining icing that was needed to complete him, brown for the hair, the black for the outline, the glasses, the chin etc. I needed the red for his mouth. I was pretty impressed how well this cake came out and when my son saw it he couldn’t believe it. He loved it. I absolutely loved doing these type of cakes…it never gets old and I love the challenge.